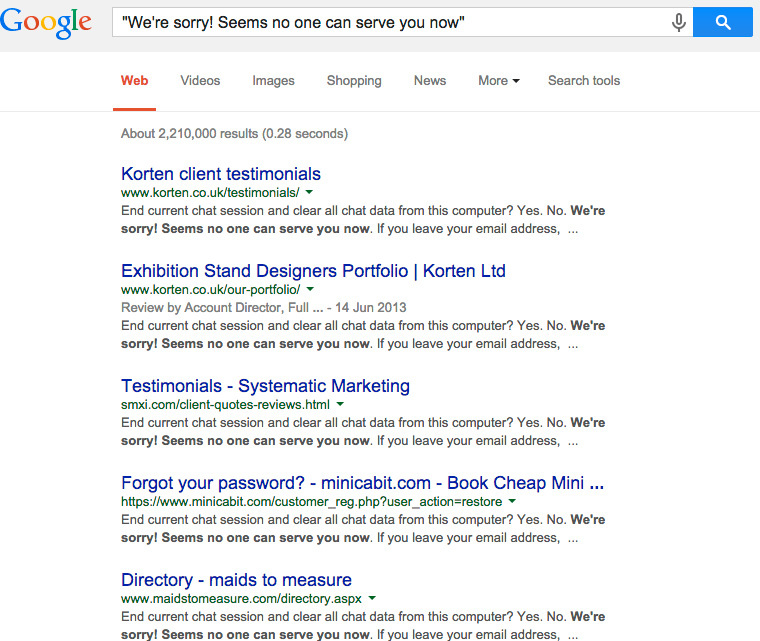 Ah, I thought, they’ve got some odd text in their page somewhere, and Google has picked up on it. So I look at the source of their home page and… no sign of the text. No use of “sorry” at all. So, maybe this is an old cache of the page and the text has changed. I check the source of the cached page in Google, nope. Now, maybe the cache is a different version from what’s being used to build the snippet, but that’s unlikely and the client says they haven’t ever had the sorry text on the page. So I checked whether anyone else is having this problem by searching for the exact start of the phase in Google. Opening up a few of the pages I can see they’re all using the same chat widget from Zopim. Sensibly, if you try to use the chat widget when no one is available, Zopim will show a friendly message saying no one can be contacted. However, it’s not the same message as I’m seeing in the snippet. I’m running out of ideas now, so use a small script to grab the source of the client’s page as if it was a search engine crawler. Definitely no phrase in there, or use of the word ‘sorry’. 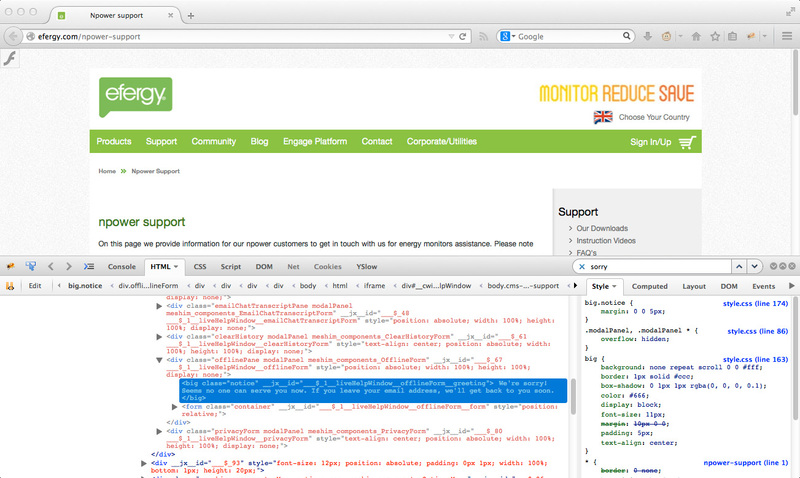 I remember Firebug in Firefox runs a little differently to Chrome’s developer tools, so use that to check a page. Hey presto, there’s the “We’re sorry…” text. Setting up the screenshot, I click on the little ‘f’ you can see below. That’s the Flashblock extension at work, in Firefox I have to click on any area where Flash wants to run. I installed it to stop obnoxious adverts running. However, when I allowed Flash to run, the message I was looking for disappeared.